Buying a record player is just one of the luxuries we all want to partake in at some point in our lives, and the reason why I’ve made this little record player buying guide is because I too was a beginner back at the time when the thought of buying one first occurred to me. In the sections below we’ll discuss all the record player types I’ve managed to think of, and I hope that this form of categorization will help you better understand what each record player type can grant you. Without further ado, let’s get straight to it. Basically, a direct-drive record player features a platter that is “directly” connected with the motor. This way, the motor benefits from an increased level of “scratching” accuracy and starts up a bit faster when compared to other types. Most direct drive turntables are capable of backward sound reproduction, however the sound might appear a bit inferior due to vibrations that motor transfers to its tonearm. That’s not a terribly big deal, but if you’re not just a beginner but an audiophile as well, consider other types. Belt-driven record players feature a separate housing for the motor. The belt envelopes both the motor and the platter which is the only rule – certain models feature an outside belt while others, more aesthetic ones feature a belt inside the housing. One of the main benefits of belt-drive record players is exactly that – since the motor is safely tucked away from the platter, the vibrations (and other interferences) which other record player types cause are neutralized, or at least kept to a bare minimum. Idle-drive record players are pretty popular nowadays, and you’re bound to come across this turntable type at some point in your search. The so-called idler drive uses a special form of friction wheel which, in combination with a rubber wheel performs a pushing motion against the motor’s shaft. One of the main benefits of belt-driven record players is that they offer a similar set of benefits when compared to direct-driven record players, but there’s a lot of gears and pieces, so the chances of any of them getting damaged (or destroyed) are significantly higher than that of any other turntable. Record player’s versatility is represented by the number of features it has onboard. Now, since you’re a beginner, it’s important to set one thing straight. 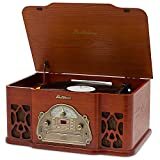 It’s impossible to determine a uniformed rule about these record players, so the only thing you can rely on is as follows – the first number in the record player’s description tells us how many features it comes with. Further on that note, versatile (and not-so-versatile) record players are present in different categories as well. For example, Electrohome’s Winston Vinyl turntable, as well as Magnavox electric record player are both 3-in-1 record players. The number three tells us that they have three features which are not parallel when compared to each other. The Electrohome’s model comes with the following features – a stereo system, AM/FM radio, and CD+AUX input while Magnavox model features Bluetooth connection, selectable speeds, and built-in decorative lights. Note that the number of features won’t be able to tell you which features are there. The same applies for 4-in-1, 5-in-1, and 6-in-1 turntables. The only exception from the aforementioned rule is represented by all-in-one record players. These turntables are, by far, the most versatile type since they almost always come with the highest number of features. Of course, the models differ between themselves through quality of features. In the audiophile world, most people take interest in this categorization – analogue record players and Bluetooth record players. This tends to puzzle the beginners even more simply because it’s wrong. Basically, Bluetooth (Wireless) record players are often outfitted with analogue settings (Magnavox Suitcase record player), but the same goes in the opposite situation (for example, Wockoder’s Vinyl player is analogue in nature but features the Bluetooth option). Analogue record players are sometimes called “vinyl” and can be found in virtually every record player buying guide. Even so, for the sake of your proper introduction to the turntable world, let’s go with this categorization and discuss the benefits and flaws of each type. One of the very basic definitions of the word “analogue” refer and relate to a contraption which uses signals and/or information represented by a variable physical quantity. Let’s break the science down a bit, and represent it in a plain way – analogue record players rely on physical parts, including gears, inputs, cables, etc. That’s why they’re often called “Wired” turntables, as opposed to “wireless” record players. Wireless record players are a thing of the future. Most models don’t even rely on the old turntable concept, so you’ll see all kinds and shapes of them in your search. The reason why they’re called wireless is because they feature a form of non-wired connection which is usually the Bluetooth software. This is not a standalone category of record players in this record player buying guide, rather I wanted to point out one exception that doesn’t fit in any of the aforementioned categories. There are flat record players (most Audio-Technica’ models belong here), and there are average-sized ones which are just a bit wider in comparison. The entirety of all-in-one record players can be considered as bulky, but other than that, there are suitcase record players which are somewhat new on the market. These suitcase-style record players can have the characteristics of all the other record player types (can be belt-driven or with an idle drive, Bluetooth or analogue, flat or bulky), but the only thing that sets them apart from the rest is that they’re more compact. They usually feature a carry handle which makes them ideal for travel. Essentially, Electrohome’s Wellington is a beautiful, highly versatile record player. Though it doesn’t come cheap, it rocks a huge value for the money as it brings a plethora of benefits to the table. 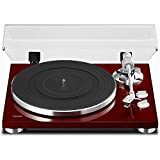 This is a 4-in-1 retro style turntable which features a robust construction with a mahogany finish, it can play vinyl records, music from CDs, but you’ll also be able to listen to your favourite tracks via AM/FM radio. MP3 compatibility, as well as USB input are also present, but the best thing about Wellington is the integrated stereo speaker system which delivers audiophile quality sound. 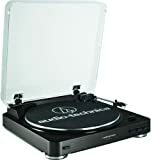 Audio-Technica is one of the most famous world-class leaders in the turntable industry, and I’ve had nothing but pleasant experience with their record players. The AT-LP60 is a fine representative of their craftsmanship, and if you’re buying a record player that excels in aesthetics, this is the one you should get. It looks exceptionally good and it comes in three color styles – the black, silver, and white. Even though it’s analogue in nature, AT has issued an improved variant which comes with the Bluetooth technology as well. Now, Teac is a big name in the record player industry, and TN-300 might be one of the finest turntables they’ve made so far. This is, basically, a manual belt driven record player which supports 33 and 34 rpm records. It packs USB output, AT’s MM phonograph cartridge, and an integrated phono EQ amplifier which substantially enhances the already great sound quality. What’s more, though it boasts a sturdy construction, it also packs a set of gold-plated terminals that boost its resistance to oxidation. There goes that – all of the standard record player types are neatly categorized in the sections above, and it’s safe to say that, even though you’re a beginner, you’ll understand how turntables work in the blink of an eye! I hope that you’ve found my record player buying guide as helpful, and I wish you all the luck in your search. This is a very timely article. With the holiday season just around the corner, my girlfriend has begun talking about a record player she wants for Christmas. Problem is I know nothing about them or how to shop for one. I’m pretty sure she wants one with Bluetooth capabilities, so the Victrola Nostalgic Classic Wood record player you showed looks perfect! OMG! This is just the guide I need. I appreciate the share! I had no idea what Idler drive means, thanks for this helpful guide! Years ago my mother mistakenly got me a record playing stereo set for Christmas. The thing was huge and bulky. I had no records at the time and only cared about using the 6 CD disc feature. All these years later, I wish I had kept the thing because now I am getting into vinyl records! Doing some shopping now, just wanted to say thanks for the list and tips!